One of my all time favourite cities has been hosting my favourite food festivals for many years. Yes, I’m talking about Toronto and yes, I’m talking about Winterlicious! Since 2003 the city hosts two events, Winterlicious and Summerlicious. What are they you ask? They are everything a foodie could ever dream of – great food – outstanding prices. Have you ever thought, I would love to dine at a restaurant that normally falls outside of your budget? Well now is your chance! 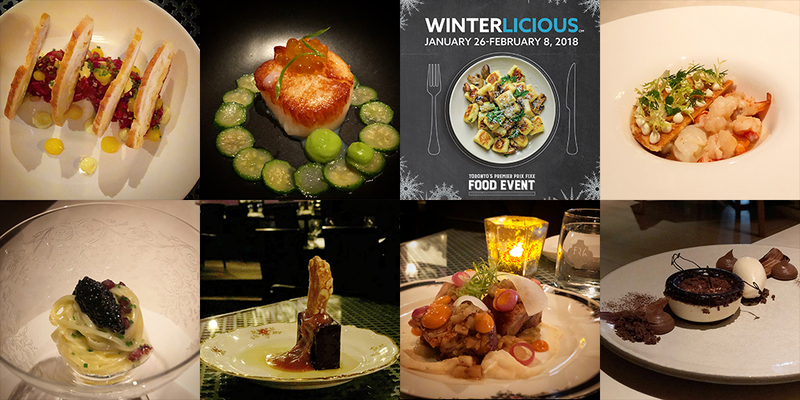 Winterlicious 2018 is a premier 3-course prix-fixe event offering diners lunch and dinner opportunities with a range of pricing to suit your budget! Lunches priced at $23, $28 and $33, and dinner is priced at $33, $43 and $53. Yeah you heard that right, 3-courses at great prices! I had the opportunity to travel to Toronto and dine at a couple of the participating restaurants. In the winter months however, travel isn’t the easiest – except when you can fly from Ottawa to Downtown Toronto in under an hour at very affordable prices! I’m talking about Porter Airlines. They offer so many flights daily that you could leave your desk at the end of your work day, hop on a Porter plane and experience Winterlicious by 7PM in downtown Toronto. Yeah – isn’t that incredible! So now that I have my travel plans well figured out I needed a place to lay my hat – and my head. If there is one thing I love more than traveling, it’s staying in style and class. One of the hottest hotels in Toronto was my hotel of choice and has caught my eye for years. I’m talking about the beautiful, luxurious and amazing Shangri-La Hotel Toronto! They offer the most spacious guestrooms in the city with contemporary yet classical style with Asian highlights. One of the coolest features for the tech in me – you can control your lights, curtains and blinds all from the in-room iPad! But best of all are the hotel staff. It’s obvious that the staff at the hotel believe in service before self and make you feel like the most important person in the world. This was phenomenal. So now that travel and accommodations were in place it was time to dine! My first dinner was at one of Toronto’s finest, Bosk. The restaurant is led by Chef de Cuisine, Richard Singh. His culinary bio will impress having worked as Chef de Partie at Thomas Keller’s acclaimed Per Se in New York City and staged at the two Michelin Star restaurant in Copenhagen, Denmark – Noma. Although the Winterlicious menu wasn’t available as I was dining a couple weeks before the festival, I got to experience what Bosk is all about and – WOW! From Northern Divine Caviar topped quail egg carbonara, to butter poached lobster, and fresh Yukon gold agnolotti with confit hen egg to Bespoke grass-fed rib-eye the menu was simply over the top! The sommelier paired some amazing wines starting with a perfect champagne Taittinger Brut NV, Champagne, France to 2010 Merlot/Cabernet Franc Blend, by Amuse Bouche, from Napa Valley, CA. Chef Singh and his team offer some of the most amazing and elegant food and I would highly recommend booking your table for Winterlicious now before it’s too late. After that meal I got to thinking – why don’t more people travel for this festival – I always have and so should you! My second meal took me to the St. Lawrence Market area where I dined at a beautiful speakeasy. This Hollywoodesque interior design, local meat and veggies and impressive cocktails make this a hotspot for myself. East Thirty-Six on Wellington St. East has developed amazing shareable plates and craft cocktails that will be sure to please. Having participated in Licious in years past, it seemed like a good fit for a menu preview. Their prix-fixe menu features some of the dishes on their regular menu so I got to try the real deal. Starting with local steak tartare with Asian influences, local braised pork shoulder with pickled cabbage and a vegetarian chocolate desert featuring amazing caramel and Maldon salt. These dishes were innovative, and featured some amazing flavours lighting up all one’s senses. This little hotspot is sure to book up quick so booking now would be a smart decision! From fantastic food to amazing accommodations and the simplicity of flight, Toronto’s Winterlicious is definitely within reach.